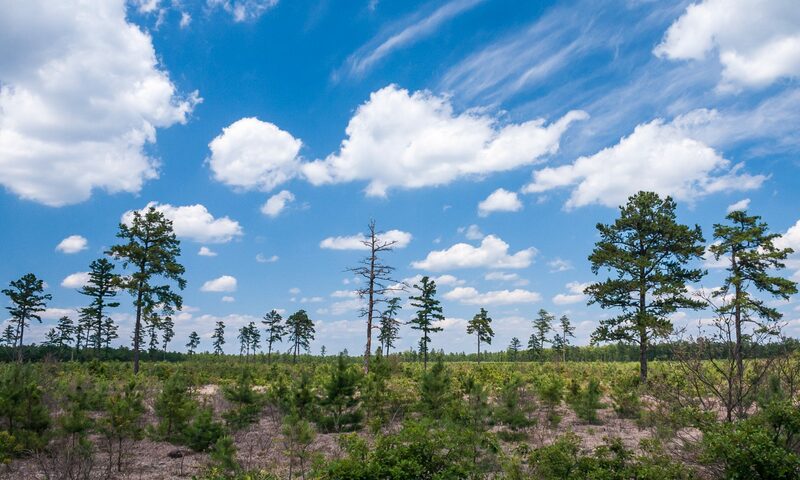 Captain John Bacon is one of the most notorious of the legendary Pine Robbers – outlaws who preyed on rebel and Tory alike in the desolate lands of the colonial-era New Jersey Pine Barrens. Bacon, like many other famed Tory leaders in the province of New Jersey, likely held a commission and gained his “Captain” title from the “Board of Associated Loyalists,” a group formed in New York under a charter from William Franklin, son of Benjamin Franklin and the last Royal governor of New Jersey. The British Government, knowing that an organized force of Loyalists would free up their armies to conduct military operations against the Continentals, approved of the Board and, as such, offered a reward of 200 acres of land to anybody willing to fight for the British for the duration of the war. Raids were to be conducted solely against military targets, and Bacon chiefly confined his “picarooning” to well-known members of the Monmouth Militia, unlike many other Pine Robbers who simply used the war as an excuse to plunder indiscriminately. The exploits of Bacon and other Refugees – Tories operating under the auspices of the Board – proved far more violent and sinister than those sanctioned by the Crown. Prior to the war, Bacon worked as a laborer on the Crane family farm in Manahawkin. Members of the Crane family would later join the Monmouth Militia. It is likely that Bacon’s Tory sympathies caused a rift between himself and his Whig employers and he either was fired or quit to join the Board of Associated Loyalists. At some point, he settled his wife and two sons in Pemberton, but spent most of his time hiding and raiding in the area between Cedar Creek and Tuckerton. One of the first actions attributable to Bacon is a raiding expedition near Forked River. Bacon plundered the house and mill of John Holmes, who was known to be somewhat wealthy. Bacon and his men camped in the woods near the mill under cover of darkness and waited for daylight. They came forward, put a bayonet to Holmes body, and demanded money. Like many others in the pine country, he buried his valuables outside rather than leave them in the house, but fortunately his wife had some money on her person. Satisfied with that, the Refugees then ransacked the house for whatever supplies they could find and retreated back into the woods. Immediately after the Holmes raid, Bacon dispatched a detachment of the bandits to Good Luck, now Bayville, to plunder the house of John and William Price. The bandits knew these two brothers well, not only as militiamen, but as people who helped care for those who had suffered at the hands of the enemy. Lieutenant (later Major) John Price once took in the daughter of Captain Ephraim Jenkins, whose house in Toms River endured the torch. John Price managed to escape the house just as Bacon’s men appeared, saving only his Lieutenant’s commission. The bandits booty included Price’s musket and drum. The Refugees used them for their amusement as they made their way back to their group. Hearing the faint drumbeat, Bacon assumed a party of Americans was after him and he set the remainder of his men up on the high ground around the mill and ordered them to fire as soon as the men making the noise emerged from the woods. Fortunately for the approaching bandits, their brethren had sharp eyes and did not shoot when they saw who was making all of the noise! The Prices were not the only patriots with which Bacon had a problem. He ruthlessly robbed and attacked Joseph Soper and his son Reuben—both members of Captain Reuben Randolph’s militia—who lived at a place called Soper’s Landing near Waretown. Bacon’s men visited so frequently that the Sopers often slept in the swamps nearby out of fear for their lives. Joseph Soper was a shipbuilder, and it’s said that one of his employees, an Englishman named William Wilson, acted as a spy for Bacon. One day Wilson witnessed Soper being paid for a vessel and raced to inform Bacon. Soper, suspicious that Wilson might betray him, split the money into two parcels, one large and one small, and buried them in separate places by his house. His suspicions were confirmed when Bacon and his men raided the house later that same day, aided by a man with a black handkerchief covering his face. Most authorities accept that this mysterious man was Wilson, although no legal proof existed that could attach him to the crime. During the raid, Joseph Soper took refuge in the swamps and only women and children occupied his house. The refugees threatened and frightened the women to such a state that they led Bacon to the smaller of the two parcels. The recovered money apparently satisfied Bacon and he simply cleaned out the house of all of its contents, as he did numerous times before, and departed with the loot. Produce was fetching exorbitant prices in British-held New York in December of 1780, and three men, Thomas Collins, Richard Barber, and Asa Woodmansee, loaded a whaling ship with produce obtained from the farms around Barnegat Bay and sailed for New York City by way of the old Cranberry Inlet, once located near the mouth of the Toms River. The men made the journey to New York safely, sold their goods, and just as they prepared to return home, John Bacon appeared and compelled the men to allow him to join them on their trip back to Barnegat. The boat made it back safely to the inlet and they anchored outside it for fear of venturing inside the bay during daylight. In the meantime the local citizens caught wind of the voyage and sought the Toms River militia to seize the vessel and put a stop to the illicit trade with the British. As night fell the men raised anchor and no sooner had the vessel cleared the inlet then they came upon a boat commanded by Lieutenant Joshua Studson, who stood and demanded their immediate surrender. The three men, unarmed, prepared to surrender, but Bacon, knowing he would face the gallows for his crimes thus far, steadfastly refused. Having his musket ready, Bacon quickly took aim and fired. Studson fell dead and the militia was thrown into such confusion that Bacon and the other men made their escape. The unfortunate crew, who only sought to make a bit of money selling produce, knew they could not stay at home and fled to the British army, where they were forced into service. Their time with the British was short-lived, however, as they soon fell “sick with the small pox and suffered everything but death” as Collins said afterwards. They later took advantage of amnesty, which General Washington offered to British deserters, and returned home. A year later, Bacon and his men claimed another victim. On December 30, 1781, a group of militia under the command of Captain Reuben F. Randolph assembled at his inn in Manahawken to search for Bacon, who had been reported to be in the area. The night grew long, and around 2 or 3 o’clock in the morning, the men in the militia decided to rest and posted sentries to watch for the bandits should they pass nearby. Shortly before sunrise, the Refugees passed by on their way to West Creek. The sentries sounded the alarm and the sleeping militia woke to find they were outnumbered. As they prepared to retreat, the bandits open fire and killed one of the patriots named Lines Pangborn and wounded Sylvester Tilton. Bacon did not give chase, however, and continued on his way to West Creek. The shot that hit Tilton went clean through below one of his shoulders, and the attending physician passed a silk handkerchief through the wound in search of the musket ball. He recovered his strength and vowed revenge against a man named Brewer, one of Bacon’s men. After the war, Tilton discovered that Brewer resided in some remote cabin and set out to avenge himself. Along the way, he met a Quaker named James Willets who begged in vain for Tilton to abandon his trip. Failing at that, Willets asked to accompany Tilton in hope he might be able to defuse the situation should the two men meet. Tilton, determined to find Brewer, warned the Quaker that, should he interfere, he’d get flogged as well. Tilton arrived the cabin and burst through the door, surprising Brewer, who didn’t have the chance to reach for his musket. Dragging Brewer to the door, Tilton gave the fellow an unmerciful beating and then told him “You scoundrel! You tried to kill me once, and I have now settled with you for it, and I want you now to leave here and follow the rest of your gang.” By then, most of the Refugees had settled in Nova Scotia. Bacon’s most notorious act is known as the “Massacre on Long Beach.” On October 25, 1782, the privateer galley Alligator discovered a cutter from Ostend, Holland, bound for St. Thomas, abandoned on the north end of Long Beach Island. It is not known exactly who commanded the Alligator. A contemporary Tory newspaper puts Lieutenant Andrew Steelman of Cape May as captain, while others claim that David Scull was master. Captain Joseph Covenhoven was also on board. The wrecked cutter had a costly load of Hyson tea and other “valuable articles” worth £20,000. Steelman went ashore to round up some locals to help transfer the cargo to the Alligator. The locals rounded up included William Wilson who, upon seeing the beached vessel and the crew of privateers unloading her, ran to Bacon and told him about the situation. Bacon and nine of his men arrived later that night after the exhausted (and likely drunk) privateers had fallen asleep on the beach. Under the cover of darkness and moving silently across the sand, the Refugees snuck up to the sleeping crew, drew their knives, and murdered most of the crew. Those who awoke to the noise were at a disadvantage and secured their rescue only when Scull, aboard the Alligator, led reinforcements ashore. Scull’s men managed to scare off the Refugees, who withdrew back into the night. Scull, for his part, suffered a wound in the thigh. Steelman was dead, and, according to a British report of the incident, Bacon and the Refugees killed or wounded all of the party except for four or five. Reuben Soper, who had deftly eluded Bacon by sleeping in the swamp with his father, was one of the men killed that day. From this point, Bacon was a marked man. 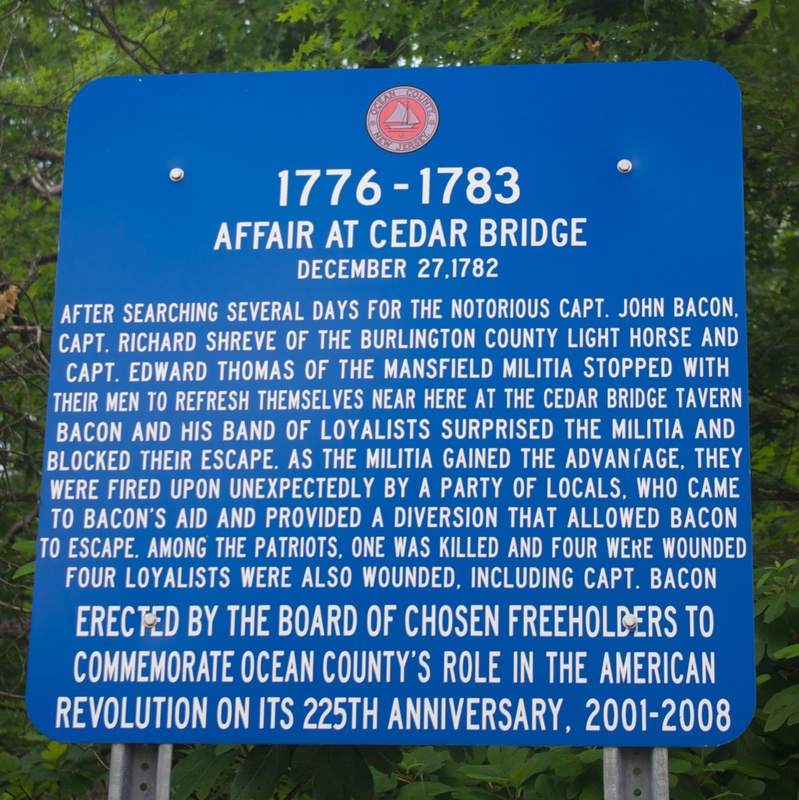 In late December, 1782 a party of men under the command of Captain Edward Thomas of the Mansfield Militia and Captain Richard Shreeve of the Burlington County Light Horse were in hot pursuit of Bacon near Cedar Creek. 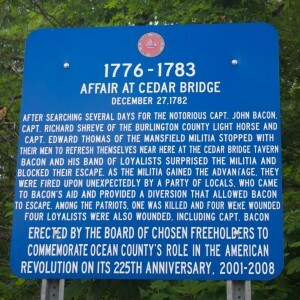 Knowing that they were being pursued, Bacon decided to build a barricade across the south side of Cedar Bridge, opposite the tavern on the stage road to Barnegat. The barrier constructed, all that remained was to wait for the Continentals. The militia arrived, opened fire, and charged the Refugees. Bacon, knowing he could not expect anything except the executioner should he be captured, urged his men into a stiff resistance that lasted for a considerable time. Finally the militia seemed to be getting the better of Bacon’s men, when suddenly shots rang out from a different direction. Locals, for some reason sympathetic to Bacon’s cause, began firing on the militia. The confusion allowed Bacon and his men to retreat, and the militia could do nothing more than arrest those that had fired upon them and transport them to the Burlington County Gaol. When the smoke cleared, Thomas and Shreeve discovered the militia had suffered two casualties – William Cook, dead, and Robert Reckless, injured. Ichabod Johnson, a refugee who carried a bounty of £25 on his head, was slain. Bacon and three other of his men suffered injury, but escaped. Commemorative marker on Rt 72 near Cedar Bridge. 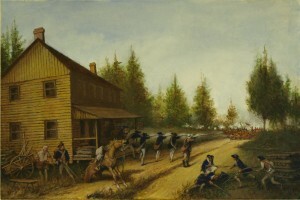 A detachment of Shreeve’s troops consisting of John Stewart, John Brown, Cornet Joel Cook (brother of William), John Brown, Thomas Smith, John Jones, and one other unknown man, pursued Bacon and finally caught up with him on the evening of April 3, 1783 at the public house of William Rose, located between West Creek and Tuckerton. Approaching the house, Stewart peered through the window and there spied Bacon sitting with his gun between his knees. Stewart withdrew and gathered his companions, who then all returned to the house. Stewart burst through the door, surprising Bacon, who reached for his gun. Stewart lunged for Bacon before he could fire and wrestled him to the ground. Bacon then cried out for quarter, which Stewart granted. Both men arose from the floor and Stewart called out to Cook. Cook, upset to finally face his brother’s murderer, gave Bacon a bayonet thrust that somehow went unnoticed to Stewart or the other men. Bacon appeared faint and fell, but shortly revived and attempted to escape through the back door. Stewart pushed a table against the door that Bacon then knocked aside, and then struck Stewart to the floor. Bacon attempted to open the door and escape when Stewart, who had regained his feet, shot him. The ball passed through Bacon, through a piece of the building, and bounced harmlessly off the chest of Cook who stood guard outside. The militia carried Bacon’s body to Jacobstown, where the Americans began burying his body in the middle of the road in the presence of many locals, who had turned out to see the spectacle. Before they had a chance to lower the body, Bacon’s brother arrived and pleaded with the militia to allow him to claim the body for a private burial. It is said that Bacon, his grave marker now long gone, is buried in the cemetery at Arneytown. Edwin Salter, A History of Monmouth and Ocean Counties, Embracing a Geneolgical Record of the Earliest Settlers in Monmouth and Ocean Counties. (Bayonne, NJ: E. Gardner & Son, 1890), 212. 1st NJ Volunteers, 1NJV Tidbits, http://1njv.org/tidbits.html (June 21, 2011). Edwin Salter, George C. Beekman, Old Times in Old Monmouth Historical Reminiscences of Old Monmouth County, New Jersey. (Freehold, NJ: The Monmouth Democrat, 1887), 43. Renee Brecht, The Long Beach Island Massacre, part 2, http://www.njpinelandsanddownjersey.com/open/index.php?module=documents&JAS_DocumentManager_op=viewDocument&JAS_Document_id=205 (June 21, 2011). American War of Independence – At Sea, The Long Beach Island Massacre http://www.awiatsea.com/incidents/25%20October%201782%20The%20Long%20Beach%20Island%20Massacre.html (June 21, 2011). New Jersey Gazette, Trenton, January 8, 1783. George F. Fort, MD, “An Account of the Capture and Death of the Refugee John Bacon,” Proceedings of the New Jersey Historical Society, (Newark, NJ: New Jersey Historical Society, 1847) 151. New Jersey Gazette, Trenton, April 9, 1783. Henry Charlton Beck, More Forgotten Towns of Southern New Jersey. (Rutgers, NJ: Rutgers University Press, 1963) 260.